Never have I met open roads like those in Ontario: endless pavement just begging to be hurtled down and not a person in sight to hear you bellow out Broadway hits. Here, you feel truly alone — in the best way possible — and free to explore anything you want. But along these seemingly endless travels, one must refuel. 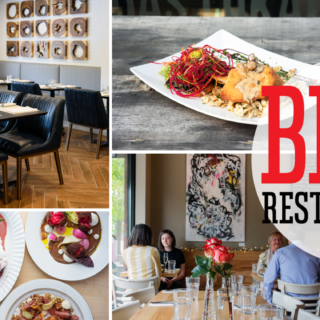 Through my journeys, I’ve dined at truck stops, devoured my way through bakeries, collapsed in tea rooms, and feasted at burger bars to discover the best hidden secrets that small towns outside Ottawa have to offer. As the sun spread over the fields of Carp, I stumbled across Alice’s Village Café, nestled right in Carp’s tiny town centre. 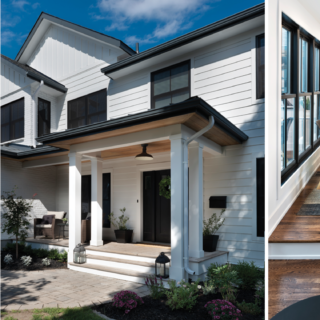 From the outside, Alice’s is welcoming, but inside, the contemporary-cottage decor helps frame a delightful foodie experience. Alice’s open dining room mixes reclaimed-wood details with high ceilings and industrial light fixtures, something that makes my inner designer scream with delight. During the day, Alice’s has a walk-up counter where you can casually order coffee and baked goods, as well as their signature sandwiches, which also just happen to come with house-made potato chips. May I repeat: House. Made. Potato Chips. At night, Alice’s turns into a fully functioning restaurant, with table service and a selection of craft beers to enjoy. But back to the bakery portion, because here is where you’ll find The Big Nasty. A cinnamon bun that will make any other attempt feel very substandard and insecure. The Big Nasty is large, hence its name, but it is anything but nasty. This bun is served warm, in a small tin dish, which perfectly contains a pool of warm caramel, so none goes to waste. Also, it’s served with a side of fluffy butter, so… yeah. 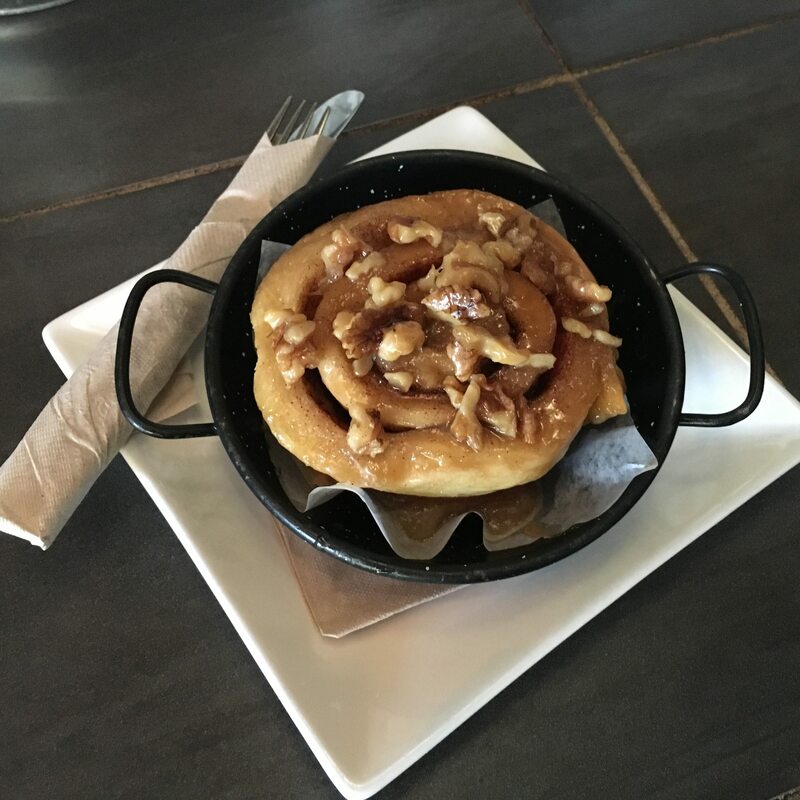 Its deep golden outside gives it that slight chew we all crave from a cinnamon bun, and it is dotted with whole walnuts, whereas the middle is angelically light and fluffy. It’s recommended to eat this with a knife and fork — that way, you can slice off a piece and then trail it through that waiting caramel bath. However, I must point out that cinnamon buns usually don’t just happen like this: chewy crust, comfy centre, and an ideally thick caramel that coats but doesn’t disrupt the main event. This truly is a skilled piece of work that must have been developed over time. Almonte is an old mill town 40 minutes west of Ottawa. Its magical main street is set upon a hill and lined with charming stone buildings. Perched at the top of the slope is the Robin’s Nest Tea Room, a cute, cozy tea shop that’s practically perfect in every way, with light blue accents and floral china. Since it’s already well known for its meringue-topped butterscotch pie, I was eager to see if there was something else to draw people to this tiny refuge. Although the pie was delicious, and I mean knock-your-socks-off good, there was one thing there that was even better: the carrot cake. Baked in a bundt pan, this nut-free, raisin-free (a.k.a. no interruptions) version has more surface area than a regular tray bake, allowing the creamy icing to coat even more melt-in-your-mouth bites. In fact, this version is so popular and well known around these parts that it’s often ordered as a wedding cake. Maybe it has something to do with the icing, mixed perfectly to avoid that obnoxious cream cheese tang. 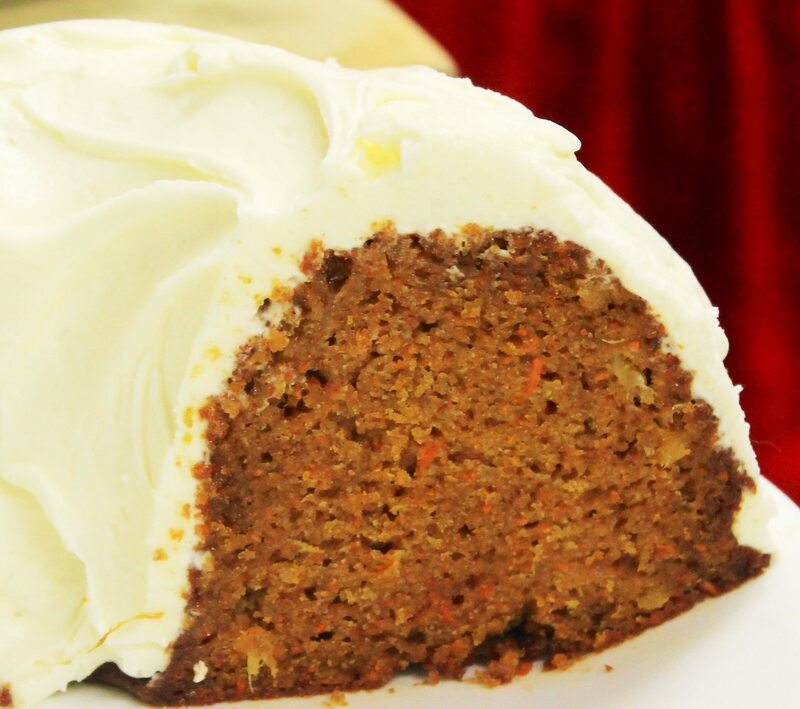 Or it could also be that the moist, deeply spiced wedge is so irresistible, any carrot cake cynics could be converted. All in all, any hesitation that has previously prevented me from enjoying this retro confection has now been resolved. While I was on the trail to sniff out butter tarts, I pulled into Antrim Truck Stop just off the main highway in Arnprior. While I scoped out the diner inside and contemplated the menu, a few warm, gravy-soaked sandwiches stood out. So when my chipper server said that people drive all the way from Ottawa for one in particular, I knew I had to try it. Christmas on a Bunis the fresh, warm version of the always popular Christmas leftover sandwich. It’s served on a house-made cheddar bun with toppings of buttery, herb-heavy stuffing and freshly carved turkey breast that are enough to make you want to fall headfirst into the plate. 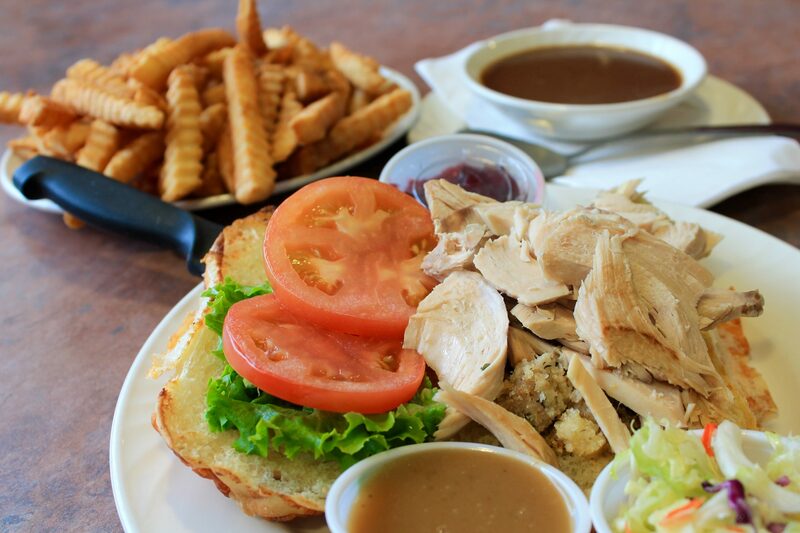 The cranberry sauce and gravy are served on the side, so you can choose when you want things to get sloppy. I chose to pour on every last drop and even added the coleslaw, to make this one of the best sandwiches I’ve ever eaten. Every bite was a harmonious blend of flavours and textures, and at that moment, everything was right in the world. Yes, there were some drips, and I may have looked like a baby without a bib, but when you’re eating something that blissful and comforting, every drama-filled Christmas memory melts away, and you’re at peace. Although every part of this sandwich complements the others, the real showstopper is the soft cheddar bun, which has crisp, cheesy edges that you can pick off and snack on as you manoeuvre your way through this beautiful mess. In its heyday, Jean Burger was located on what was the main highway in Wakefield, the 105, with more than 10,000 cars a day passing by. Although still on the route to cottage country and ski slopes, Jean Burger now sits parallel to highway 5. But although a new highway may have been added, the perfected hamburgers and poutine served up by this family-owned-and-operated business have been the same since day one. Since the ’70s, this family has been grilling their buns, hand-cutting their fries, and using house-made, 100-per-cent beef patties. Simple, satisfying, and unchanged. 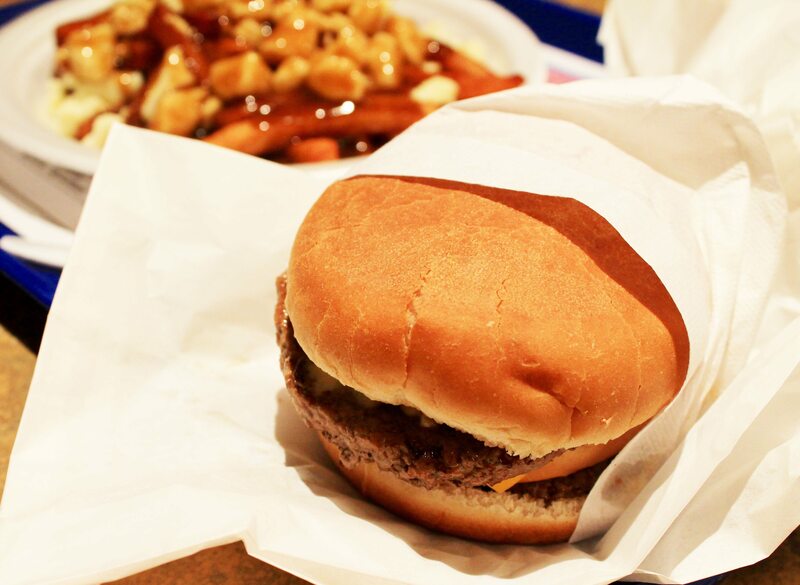 The must-have meal here is Le Grand Burger with a side of poutine, topped with extra cheese and gravy. Le Grand Burger is two piping hot patties separated by three fluffy grilled buns. Finished with cheese, lettuce, tomato, and special sauce, its structure may sound familiar, but the similarities end there, as this burger is as fresh as it gets. Served in parchment envelopes, the burger is wrapped in crisp, white paper that gives a feeling of nostalgia — I feel as if I’m eating something my mom would have eaten when she was my age, before food and everything about it got so complicated. During the colder months, the wood-accented, licence-plate-decorated dining area is warmed by a wood stove, just another element that adds to its authenticity. In summer, their takeout window is also open and the property is lined with benches for you to sit and enjoy your meal outside. If you really want to know how old school and unaffected this place really is, be sure to take cash, as they don’t accept cards. I know, how could they? But they’ve always stuck to the simple guns, so why complicate things now? 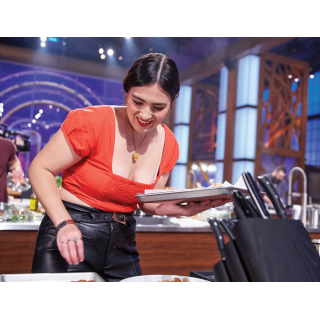 Joanna Tymkiw is a chef and food writer who has appeared on The Marilyn Denis Show, Steven & Chris, and CTV Morning Live.